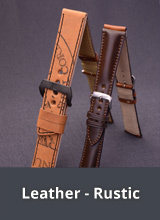 LEATHER WATCH STRAPS: We offer a huge range of watch straps made of leather in various designs and styles from notable European manufacturers and suppliers. Our product assortment ranges from quality watch straps at fair prices, to branded watch straps in premium quality, as well as hand-made watch straps. 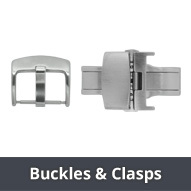 METAL WATCH BANDS: We also offer a large range of metal watch bands (stainless steel, titanium etc.) in styles ranging from classic to casual, including PVD coated bands (black, gold etc.) and mesh watch bands. SYNTHETIC WATCH BANDS: Furthermore, we provide an attractive array of watch bands made from a range of synthetic materials like silicone, Lorica, Caoutchouc, textile and more. 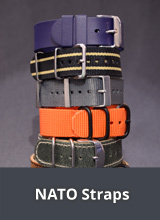 We also stock NATO-Style watch bands, bands with clasps and diver style watch bands. WATCH BAND SPECIALITIES: Looking for a special watch band? In our shop you can find watch bands in irregular lug widths, special sizes (e.g. XL extra short, extra wide), watch straps for fixed bars, one-piece watch straps, cuff straps with leather pads, specialist designs and many other watch band specialities. 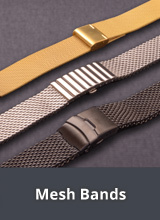 We also stock watch bands for watch wearers with sensitive skin and a wide range of easy-to-exchange watch straps. WATCH STRAPS FOR WATCH BRANDS: Additionally, we offer an extensive range of original replacement watch straps and watch straps from third-party manufacturers suitable for selected watch brands (e.g. SEIKO, CASIO, JUNGHANS, JACOB JENSEN, CITIZEN etc.). If your watch has a standard lug attachment, then an original replacement watch strap will not be necessary. 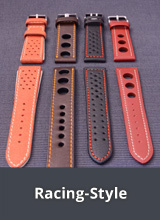 You can instead choose to fit a standard watch strap exactly in the style you like from our comprehensive assortment. 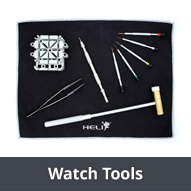 WATCH TOOLS & PARTS: On top of everything already mentioned, we also offer an complementary assortment of selected watch strap buckles, clasps, watch tools for watch strap exchange etc.. Accessories for various tasks within the watch industry are also available. Thanks to this assortment from WATCHBANDCENTER, you can purchase everything you need, from watch straps, to watch parts and accessories, all from one seller. 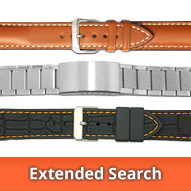 WATCH STRAP FINDER: In order to help you find the watch strap you're looking for on watchbandcenter.com we offer an extended search option. This so-called Watch-Strap-Finder should help you find the watch strap you are looking for quickly and easily within our huge assortment of watch straps. 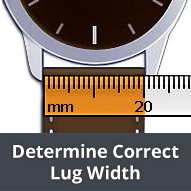 Please ensure you choose the correct watch strap lug width! 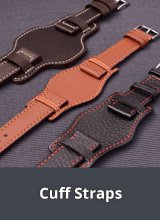 In our shop you will find a selected range of watch straps which have been made out of leather which has been vegetable tanned, a natural tanning technique. Vegetable tanned leather is, depending on the manufacturer, made using either traditional or modern and innovative production techniques. The majority of materials used to tan the leather are natural. The watch straps made out of this type of leather are suitable for those with sensitive skin and can be recommended for those wanted a more ecological product. We have now increased our large range of watch straps with EASY-CLICK quick-change spring bars in various designs and styles. Meyhofer EASY-CLICK watch straps are all fitted with special integrated spring bars (also known as Easy Change, Quick Release or Quick Pins). These special spring bars allow a simple watch strap removal and fitting, so that you can exchange your watch straps without using any tools.